One common mistake a lot of guys make is to buy pants that are either too big or too baggy. Don't be that guy and get yourself pants that properly fit your body style. My faves would have to be a fitted pair of joggers; not only are they comfy AND you can move around with them, but they keep you looking sharp! See some of my favorites from East Dane by clicking right here. A lightweight jacket easily helps you stay warm and looking your best. Try a Nylon lightweight jacket, they give a total 90's vibes, right?! See some of my faves here. Do me a favor; ditch your basic white or black tee! Not only is it boring, it looks totally basic. 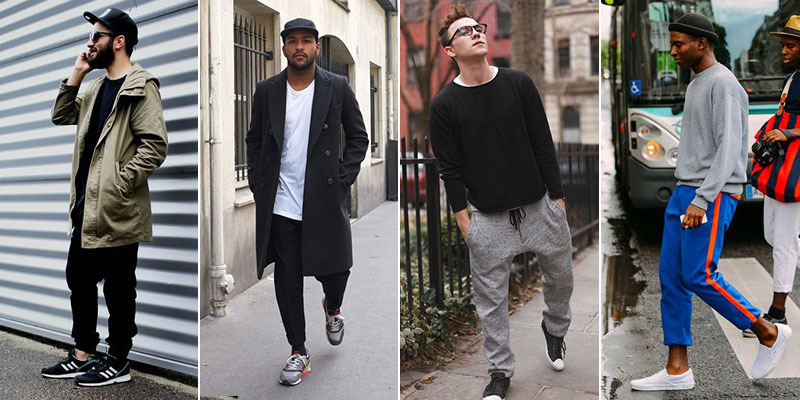 Don't be afraid to experiment with lighter tones such as grey or even light brown, they really do wonders to black sweatpants! Shop my favorite tees here. This season don't be afraid to put on your chunky sporty shoes away and trade them for slimmer alternatives such as slip ons. Extra points for getting a pair of sneakers in leather! Kick it to some of my favorite sneakers right here. Music to my ears! finalize your Sporty Vibes with a pair of sleek earphones. Today, you can find a ton of pairs of wireless headphones, so a wire across your body will no longer kill your outfit's vibe. Giving you an earful of my favorite headphones here.